This personal ePortfolio showcases a creative body of academic work that traces three decades of evolution from experiential educator (1986-1997), through entrepreneurial executive (1996-2005), to expert in teaching and learning with technology (2004-today). Educated in the sciences, I started as a professor in education and management. This led me to research and facilitate training and development programs of executive leadership and corporate team-building by experiential methods. These interests enabled me to start a successful dotcom for elearning, electronic facilitation, facilitative leadership, and virtual teaming through online communication. Upon final sale of the company, I wasn't ready to retire and so returned to higher education as an administrator and to business as a consultant. This initial page describes my guiding philosophy of the why and how. Contained in the next 5 floating menus, a visitor can find the what: models and theories that most people have requested (arranged under their paired titles). The final sixth menu provides access to past publications, lesser known accomplishments, a few special items, and several unique inventions. Throughout, I try to present professional information with a personal touch, so you can expect a few stories. Further down this page, check out the "Selected Presentations" that highlight some recent consulting. Although I currently consult for several select corporations and governments, I am no longer accepting new customers in order to reduce my workload into semi-retirement. My apologies for the mixed spelling in these webpages. I was born in the UK, grew up as a Canadian, and have worked mostly in the USA with some confusion about where I belong! Q: How many entrepreneurs does it take to change or screw-in a light bulb? A: It doesn't have to be a light bulb; we can transform it to something better! 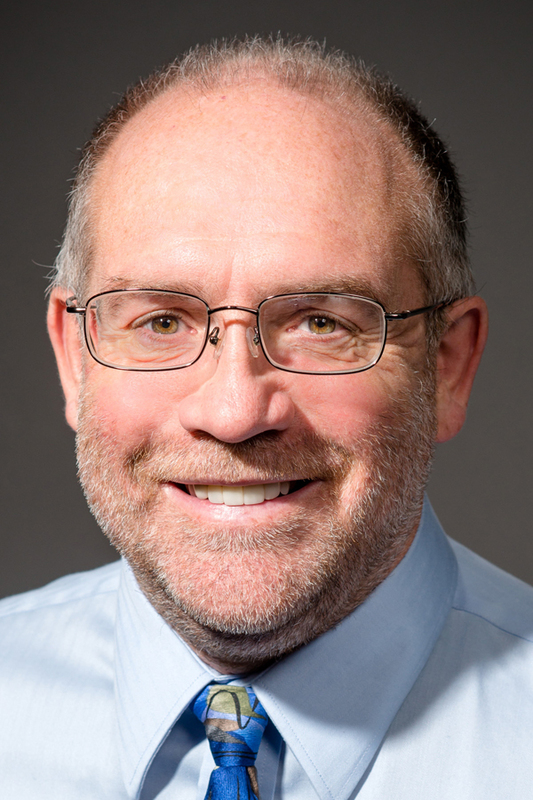 THEMES: For the past thirty years, my work has had three underlying themes: innovation, entrepreneurship and transdisciplinary collaboration. Here are some explanations and home made diagrams for each theme. 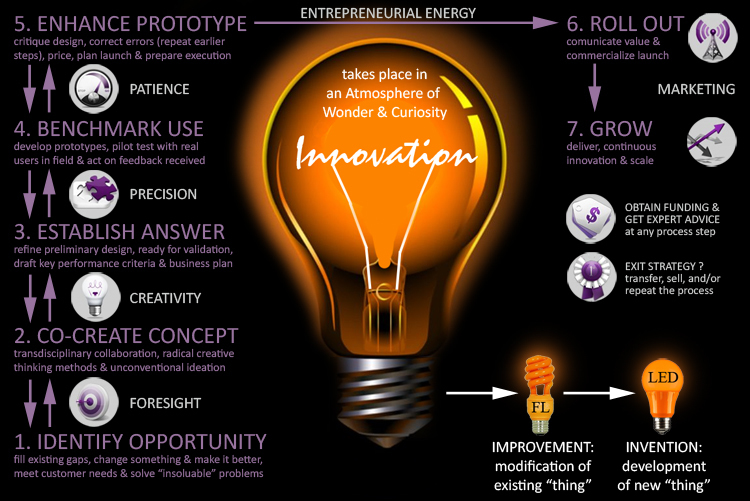 INNOVATION: The outcome of this 7-step innovation process is often an improvement or an invention. In the orange light bulb example shown, energy wasteful incandescents (with candle-like glowing filaments) have been replaced, initially by improved fluorescents (that modified the linear tube into a spiral), and then by invented Light Emitting Diodes (that required the development of all new technology to handle the LED electrical challenges). I DENTIFY OPPORTUNITY = monitor trends, seek issues, fill gaps, change for the better, meet needs, or solve problems. C O-CREATE CONCEPT = ideation through creative thinking methods conducted outside traditional discipline boundaries. E STABLISH ANSWER = refine initial designs, get ready to validate, draft performance criteria, and start a business plan. B ENCHMARK USE = develop and pilot test prototypes, while accepting feedback from actual users in the environment. E NHANCE PROTOTYPE = be critical, let go of ego, correct errors, finalize the final "thing" and get ready to release it. R OLL OUT = market and commercialize where necessary; communicate value of the "thing" before public launching. G ROW = manage the growth of delivering the "thing" and don't forget to continuously innovate as everything scales. Funding and/or advice can be obtained at any point in this sequence. Some entrepreneurs will want to have an exit strategy, where they sell or transfer the innovation and begin again from scratch. The leadership skills necessary to succeed during incubation of each innovative idea include: foresight, creativity, precision, patience, entrepreneurial energy, and marketing. If you don't have these leadership skills, partner with someone who does and let them take care of the steps that are their forte. While this progression has a distinctive business bent to it, the same ideas are relevant for the innovation of any better mousetrap: theory, model, system, method, structure, technique, process, practice, product, service, or "thing!" 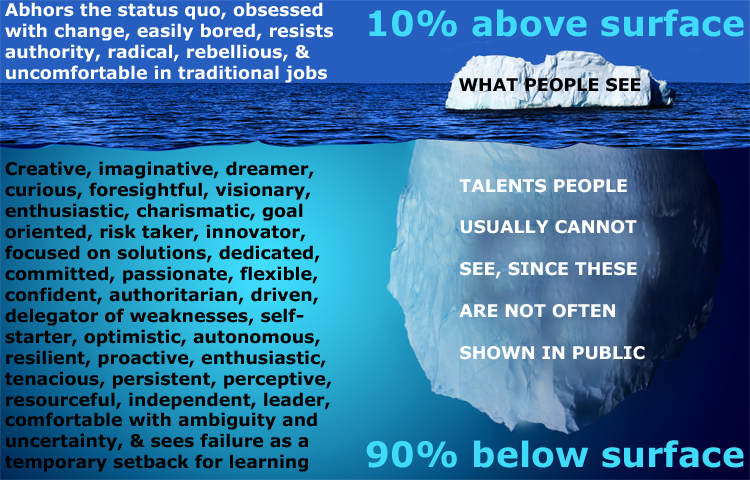 ENTREPRENEURSHIP: Continuing with the iceberg metaphor, entrepreneurs have certain characteristics and traits that people see (10% above the surface) and other talents and skills that remain unknown (90% below the surface). A partial list of those is shown here and these are the kind of people I love to work with. 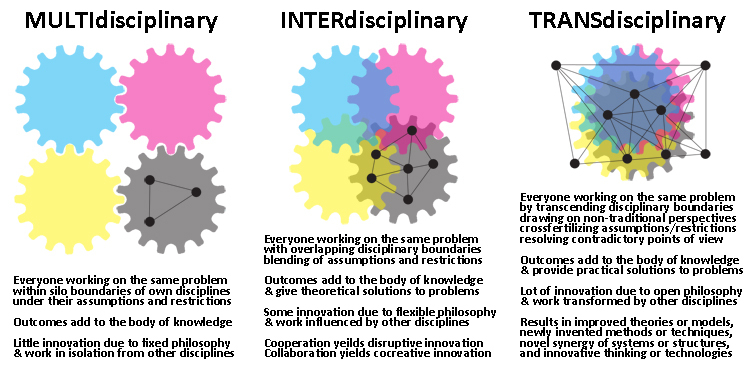 TRANSDISCIPLINARY COLLABORATION: My preference over interdisciplinary cooperation. We have very little of the former and too much of the latter. We will not solve world problems, like climate change, with one approach. 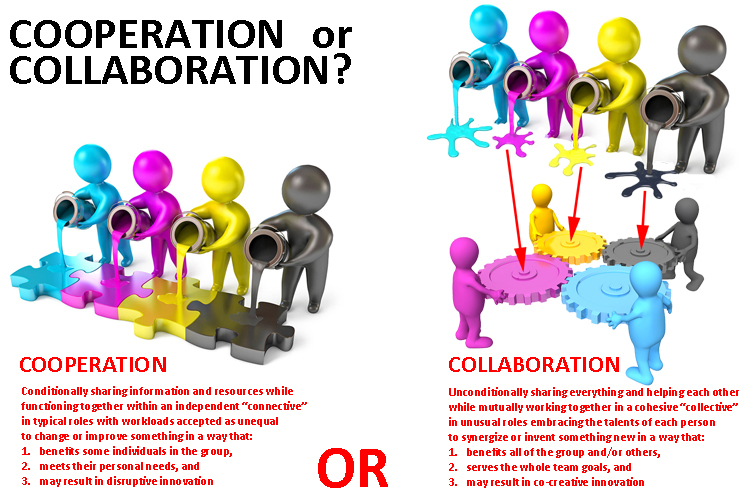 What is the difference between collaboration and cooperation? Cooperation is a group of people who share information or resources and function independently to connect individual results. Without the need for a coordinator, this "connective" can achieve disruptive innovations much like a drum circle, where everyone plays a similar instrument to their own beat in cooperation with others. Collaboration is a team of people who share everything (unconditionally, including mutual assistance) and work together to collect the same synergistic result. With the need for a coordinator, this "collective" can achieve co-creative innovations much like a conducted orchestra, where everyone combines their own different instruments in collaboration of a new symphony. We need both cooperative and collaborative approaches to provide some disruptive and more co-creative solutions. What is transdisciplinary? Multidisciplinary is everyone working on the same problem, but within the silo boundaries of their own disciplines and under their own corresponding sets of assumptions, restrictions, and philosophies. This results in adding to the professional body of knowledge, but with very little innovation, because the assumptions, restrictions, and philosophies are mostly fixed. Interdisciplinary is the overlap of disciplinary boundaries to form sub-disciplines with the blending of some common assumptions, restrictions, and philosophies. This imagines new knowledge and theoretical solutions. Transdisciplinary is transcending disciplinary boundaries by drawing on non-traditional ideas to cross-fertilize any contradictory assumptions, restrictions, and philosophies. This executes a synergy of systems or structures, improved theories or models, newly invented methods or techniques, and innovative thinking or technology leading to practical solutions. We need interdisciplinary and then transdisciplinary approaches to imagine and then execute solutions. 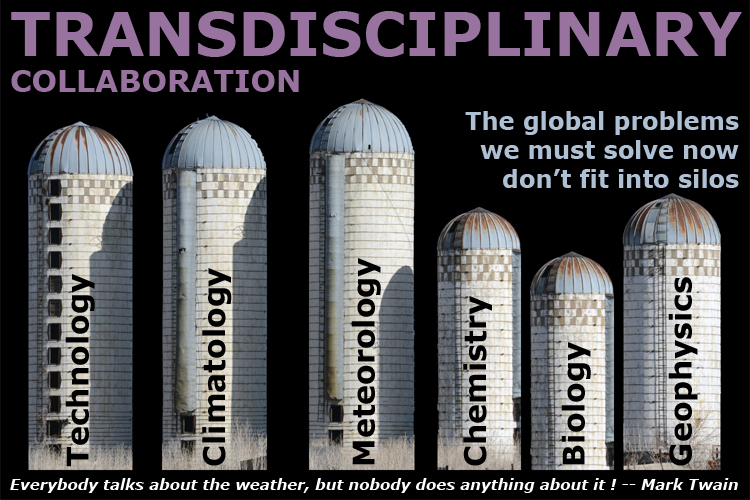 Transdisciplinary collaboration is my preference for solving our world's current and future big problems, simply because we have less of it (and more interdisciplinary cooperation) these days. I believe many solutions will be crowd-sourced in virtual makerspaces. By this, I mean people from all disciplines and no particular disciplines will come together through online environments to solve problems. Some will cooperate in connectives and come up with a few disruptive innovations. Others will have coordinators and collaborate in collectives to find a few co-creative innovations. Hopefully, such sourcing, from this crowd of people applying transdisciplinary collaboration, may result in solutions to the world's current problems like climate change (as per the Mark Twain quote earlier). In crowd-sourcing, integration refers to the way we combine citizens (members of a society or community) with academics (scientific researchers) and we can express the type of research conducted according to the four quadrants above. 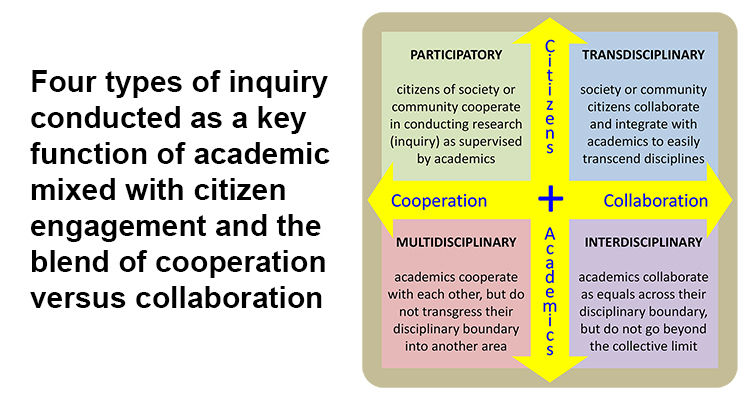 Research or inquiry is participatory when it engages citizens in the process, but can become TRANSDISCIPLINARY when that inquiry process shifts from cooperative (where citizens contribute to research, but under the supervision and direction of academics) to collaborative (where citizens are equal partners in the contributions). The same process shift from cooperation to collaboration moves academics only research from multidisciplinary (where researchers cooperate, but stay in their own disciplines) to interdisciplinary (where researchers collaborate among all disciplines, but not outside this collective). For each SLIDESHOW, CLICK ON: to go to the previous or next slide and on to enlarge in full screen or view in LinkedIn's SlideShare (some tables use small fonts). Here are consulting presentations from 2016. These VIDEOS inspire me. For each, CLICK ON: to play, to enlarge, to adjust volume, and to see the entire length (about half of these videos are short excerpts from worthwhile longer presentations). This search engine relies on Google Custom Search and will display ads, just like all Google results. Enter your search word in the text box below and then click on the Search button to return links of the relevant pages. Since Google only returns the page link, you will then need to open that page and use your brower search function to find that word. Sorry, but this is the best that Google does in this regard and it can be slow! PLEASE WAIT FOR IT TO LOAD ABOVE. If you have any difficulties with this search, please describe the concerns and I will do my best to straighten out all problems. Thanks. Contact via email address below (remove spaces). Unauthorized use and/or duplication of this content without express and written permission from simonpriest.com is strictly prohibited. Links to this content may be used, provided that full and clear credit is given to simonpriest.com with appropriate and specific direction back to this original content and page.